Although life as a missionary can be difficult at times, there are also many joys that come with serving God across cultures! CMS worker J, (serving with D and their two sons) shares 10 reasons why they love serving in South East Asia. Your church plays a vital role in God’s global gospel mission. We hope you are challenged and inspired as you read how some Australian church leaders are engaging in, and equipping people for long-term cross-cultural mission. Coping with difficulty is an inevitable part of life for every Christian – and missionaries are no exception. 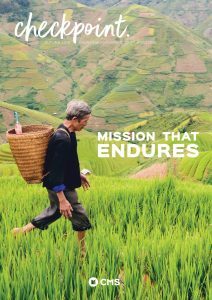 CMS missionaries reflect on some of the difficulties they have faced – both personally and in ministry – and what they have learned about persevering. CMS workers Brad Jackson and John Lovell reflect on how God worked in their lives in different and often unexpected ways to bring them to serve him long-term in cross-cultural mission. Brad & Michelle JacksonEast AsiaEuropeGoJapanJohn & Jodi LovellMoved to MissionSpainWhy? R (name withheld for security reasons) is teaching English as a foreign language in a secure location and building relationships with women in her community. She explains why missionaries are not ‘super’ Christians! CMS Mission Personnel Secretary Elizabeth Richards provides support and guidance to CMS cross-cultural workers as they take the gospel to the nations. Here, Elizabeth reflects on God’s amazing love, and how CMS missionaries are embracing and sharing this love across the globe.